The project began in the first floor commercial spaces. Layers of paneling and plywood, added over the years as quick fixes to conceal ignored problems, were removed. Revealed were crumbling brick walls, and rotten windows and doors. The backyard was unused and unusable, a maze of haphazardly installed gas, water and electric meters. Rear entrances, long dysfunctional, had been boarded up and abandoned. The entire rear wall of 143 and F, above, was a patchwork of inappropriate doors and windows, unstable and inadequate from ground to roof. On the second floor, the hotel dining room, bathrooms, storage and sleeping rooms had been divided into apartments A, B, C, D, E and F.
When the project began, the apartments were in curious stages of use and completion. Apartments B, C and D still featured the wall divisions and hall doorways of the former hotel rooms. Apartment F was the most neglected, with large areas of floors and interior walls missing. The most prominent features of the new work are the central deck and balcony; and the new stairway, porch and patios below it. Window openings in the foyer and in apartments D, F and E, were transformed into doorways. The rear of Studio 137, under a shed roof, became the porch and rear stairway. The first floor commercial spaces were completely rehabilitated and partitioned for office, café, shop and live-work use. The basic floor plans of the second floor apartments were retained but re-worked and in F and A, reconfigured. Apartment A became new A and the Courthouse Suite. Additional entrances on the hall to B, C and Dl were eliminated, and the kitchens of those units were opened up and incorporated into the adjoining living areas. The commercial spaces have been restored as office, live-work, Studio 137 and the Town Square Café. The hotel rooms above have been converted into seven apartments. Five of those units, complete with Whirlpool appliances, are offered for lease, unfurnished. The sixth, the Courthouse Suite, is a fully-furnished efficiency available for rent for overnight stays. 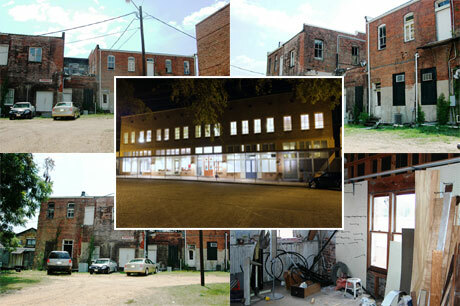 The owners divide their time between New Orleans and Woodville, and make the seventh unit their Wilkinson County home. But don’t just take our word for it – see for yourself. These Gallery photographs show the evolution of the project – where we started, where we finished and how we got there.